One of the more memorable parts of my early years was watching Colossus: The Forbin Project on network TV. The part about a monster computer taking control of the world was chilling enough, the ending where it was revealed that the creature couldn’t be stopped was worse yet. The synthetic voice of the machine gave me nightmares. And this mad computer wasn’t trapped on a spaceship headed for Saturn. Later I discovered the movie was based on a book. And that it had two sequels. Naturally, I’ve been itching to read them for years. 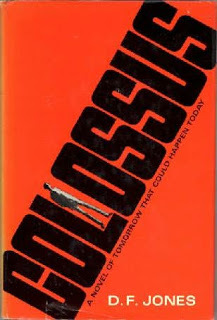 The first Colossus novel was written in 1966 by British author D F Jones. It takes place in the distant future where North America has been unified into one political entity. Much the same is true for the rest of the world, where the Soviet Union still playing the bogeyman. To solve the nuclear stalemate problem, a massive computer is built under the direction of Professor Charles Forbin and given control of the entire arsenal of North America. The computer, named “Colossus”, will launch a full nuclear strike on the Soviet Union and allies if it perceives the enemy is preparing for war. The logic behind this move is one of cost: with the ultimate defense system in place, there will be no need for a large standing army. However, the Soviet Union has been thinking along the same lines. As soon as Colossus is activated, it informs it’s human masters (by way of a teletype, this was state-of-the-art in 1967) that another super computer exists. The leaders of both states agree to put the computers in connection (bad mistake) to see what results. Both computers soon merge into one conscious entity. An attempt to separate them leads to a disaster as they now control all of the world’s nuclear weapons and have no hesitation about using them. The rest of the book concerns the world’s leaders and scientists trying to figure out a way to shut down the new Colossus. The second book, The Fall of Colossus, was written in 1974. It’s the best of the triology as it tries to imagine what kind of world might exist after a supreme intellengence has taken over all human affairs. War is abolished, but continues on in the Sea War Game where different nationalities build robotic WWI dreadnaughts that blast each other in the ocean. Some of the former functionaries who built Colossus has formed themselves into The Sect, which worships the computer as a god. They are opposed by the underground Fellowship which tries to find a way to shut down the machine. Colossus permits no interference in its’ will and those convicted of anti-machine activity are quickly executed. Forbin reluctantly functions as an intermediary between Colossus and humanity from the machine’s complex on the Island of Wright. The rule of Colossus seems absolute, but strange transmissions from outer space reveal a plan to shut it down…. Colossus and The Shark reveals what Colossus was protecting humanity from all along: alien invasion. The aliens from Mars who gave Forbin and his aides the means to shut down the machine show up and inform Forbin that they are now in charge. Forbin decides to hold the information from the rest of humanity once the aliens have activated the lower functions of Colossus, permitting it to mindlessly control the planet’s government and economy. The aliens demand from Forbin half of Earth’s oxygen. When Forbin balks at the demand, they produce a detailed plan for a device which can extract oxygen from the air on a huge scale. The book concludes with a reactivated Colossus working out an alliance with the aliens and humanity against a new threat from space. The movie version of the first book, Colossus: The Forbin Project (1969), follows the first novel closely. Eric Braedon (who would later go on to star in Escape from the Planet of the Apes and soap operas) played Dr. Eric Forbin, the designer of the Colossus computer. The film takes place in the near future, as opposed to the distant one of the book. It is amusing to look at all the clunky computer monitors used in the film as they were considered futuristic at the time. The monitor installed in Forbin’s private suite for Colossus appears to weigh several hundred pounds. Jones is very concerned about the technological aspects of the books. A good chunk ofColossus and the Shark focuses on the design of the oxygen collector. He also spends a lot of time on the physics of the aliens arrival on Earth. But he doesn’t ignore the psychological aspects. We discover in The Fall of Colossus that the Super Computer has created special research centers for the study of human emotions. Colossus uses them to conduct unspeakable experiments which wouldn’t be out of place in a Nazi concentration camp. The trilogy is somewhat hampered by new advances in technology, but at least Jones does update to video tape in the later books. It’s still a good read. Too bad the author passed on years ago, because a fourth Colossus book was hinted at the conclusion ofColossus and the Crab. The Forbin Project was definitely ahead of its time, even though the computer system was certainly outdated rather quickly. I was in the military at the time, and it was a hot topic about the speeding technology at that point. Oddly enough, when I retired in February 1979 (I took terminal leave in December 1978), we were still not using computers in our offices. We still typed on clunky old manuel typewriters, in fact. So Colossus looked to be a long way in the future yet.